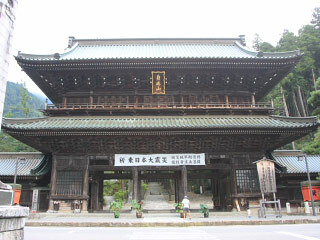 Kuonji Temple (久遠寺) is the head of Nichiren Buddhism Temple located in Yamanashi. Kuonji was established in 1281 by Priest Nichiren. Nichren entered Mt Minobu in 1274 and spent his last years in here. Nichiren died in 1282 at Tokyo and he told his people to build his grave here. As the top of Nichiren Buddhism, many people has worshipped at Kuonji even today. The sprit and teach of Nichiren are still alive here. 0. at Kofu Station or Fuji Station. 1. use JR Minobu Line to Minobu. There is shuttle bus from Shijuku Station. Minobusan Kuonji is the head of Nichiren Buddhism. It is located in Minobu, Yamanashi Prefecture. Priest Nichiren practiced at Mt Minobu and built a small temple in 1274. Since then, Nichren had never left this temple for 9 years and practiced until his last days. In 1282, Nichiren left to visit the grave of his parents at Mito, Ibaraki. On the way of his worship, he passed Ikegami, Tokyo. He was 61 years old. He told his students that buried him at Mt Minobu and built Konji as the head of Nichiren Buddhism. Since then, it is the top of Nichiren Buddhism and many people still worship Kuonji. The main gate Built in 1907. 287 steps 104m high built in 1632. 5 stories pagoda built in 2008. It was built in 1988. The size is 32m wide and 51m deep. The bell was mad in 1624. Worship temple for the grave of Nichiren.